Everyone can reach caucasus from Eastern Europe. The border between Georgia and Russia is closed to all non CIS citizen and one of the most beautiful way to reach caucasus is by sea. There is a ship from the harbor of Ilichevsk to Batumi in the Adjara Republic of Georgia. The trip takes almost 4 days and cross a big part of the Black sea. Inside the ship there are a lot of migrants who are working in Ukraina and they're coming back to home. Some families cross the Black Sea for don't take the risk to pass the border with Russia on the way back to Georgia, due also to the situation in the East part of Ukraine. The ship is also used by a large number of truck drivers who are going inside caucasus, almost Azeris. During the four days trip I knew also some ossetian families who are now living in Ukrainke and they were trying to come back to Tskhinvali in The indipendent republic of South Ossetia, avoiding the Ukrainian-Russian border. 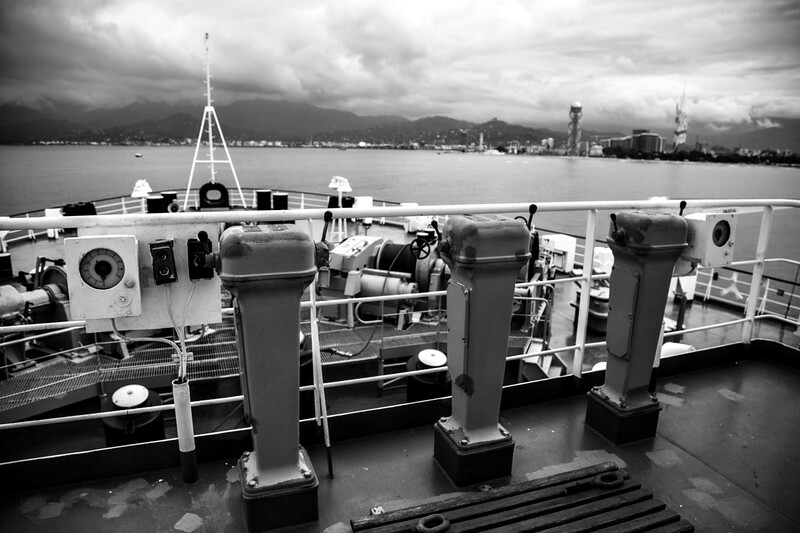 A view of Batumi City from the ship's deck, some minuts before moor in the harbor.